japan | Crappy Kitchen - Good Dinners! If it is Japanese and my son happens to spot it (and believe me he is always on the lookout!) it will most definitely make it’s way into our shopping basket at least once. Then, if it gets rave reviews, it usually earns a permanent place in the pantry. 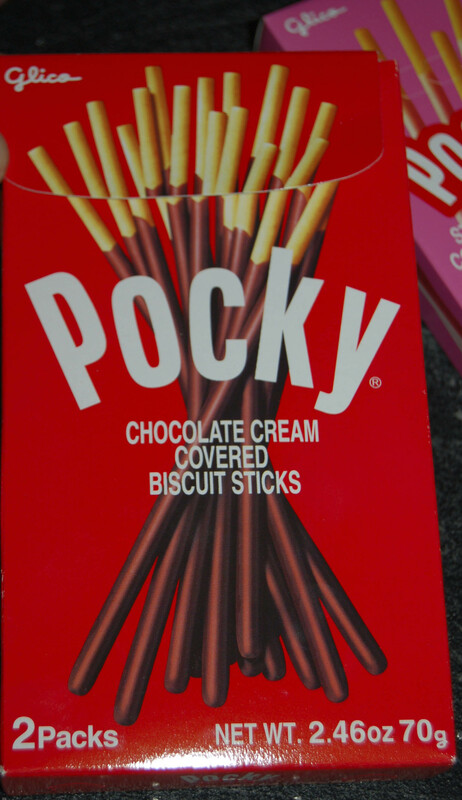 This is how Pocky found it’s way into our lives and into our greedy hearts! 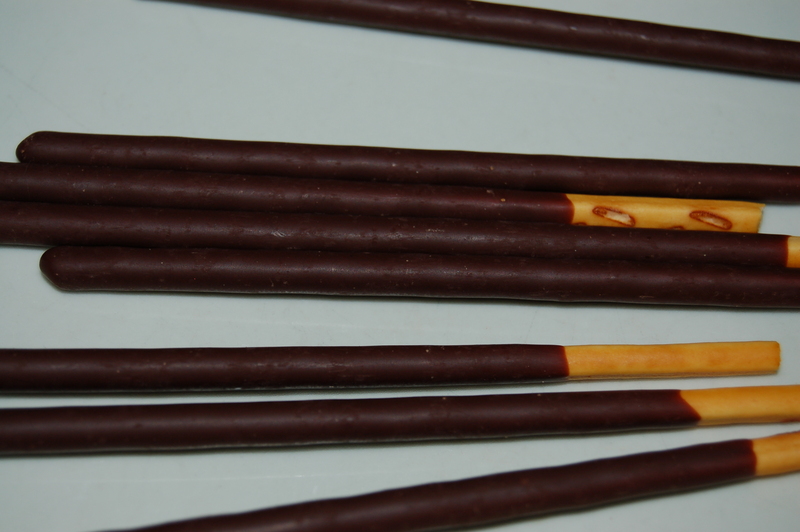 Pocky: a chocolate covered plain biscuit – pure and addictive. It is a very simple thing, but when you combine two tried-and-true staples it is hard to go wrong – at least when it comes to chocolate (in my opinion anyway!). I will admit to being the kind of food shopper who is completely won over by a really great display of fresh herbs and I can spend a lengthy amount of time staring at a glass case full of confections of any kind, giving in according to my mood and how much money I have to spend on trivialities. Combing the shop for Japanese sweets was never part of my routine until my son discovered his love for all things Japanese at about the age of four and it hasn’t relented or waned into Teenagedom (can you say that? I’m sure not – ha). Very sweet pink box with delicate strawberry cream that is irresistible. This is another thing I love about being in the company of my two children. They get ecstatic about things I either never knew existed or about things I thought I had no interest in whatsoever, that is until I become infected by their pure and utter enthusiasm for whatever the “thing” happens to be. Some of the stuff is short-lived and not worth investing any of my precious time but over the years I have learned when to sit up and pay attention. 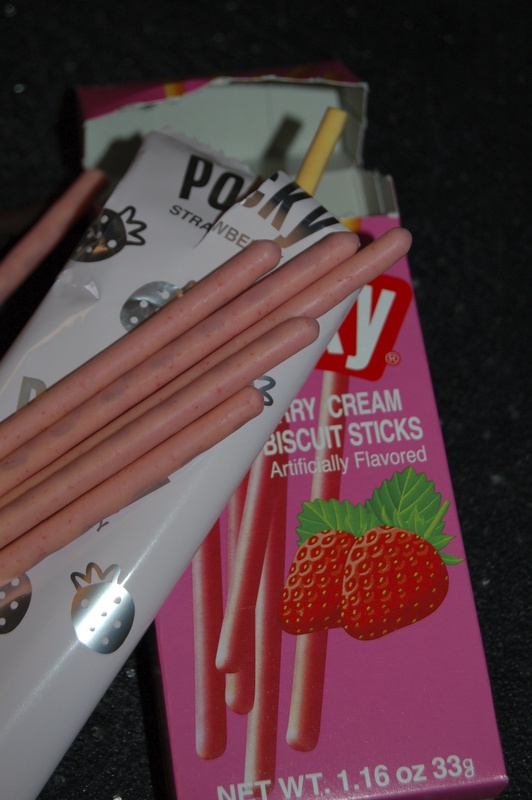 Even little things like the skinny-sticked Pocky are worth it when it plays a part in the kind of relationship I have with my kids – yes, corny and sappy is the road I happily take when it comes to my kids! 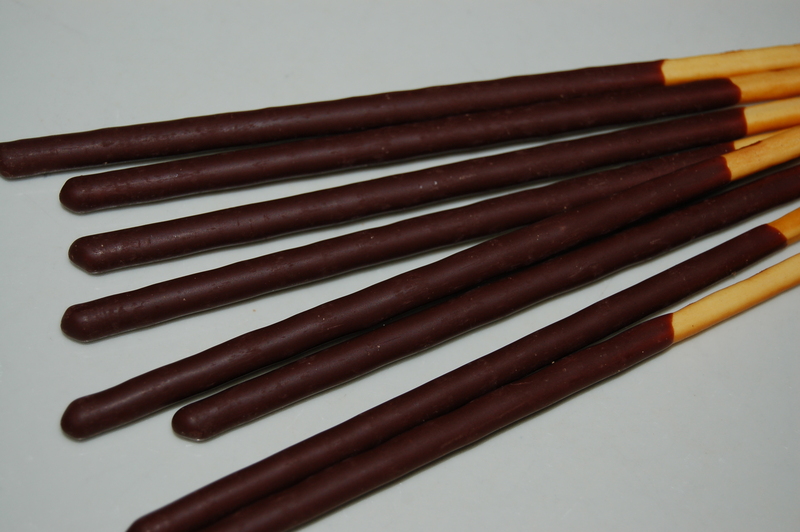 The Japanese love their Pocky with an ice-cold glass of water! 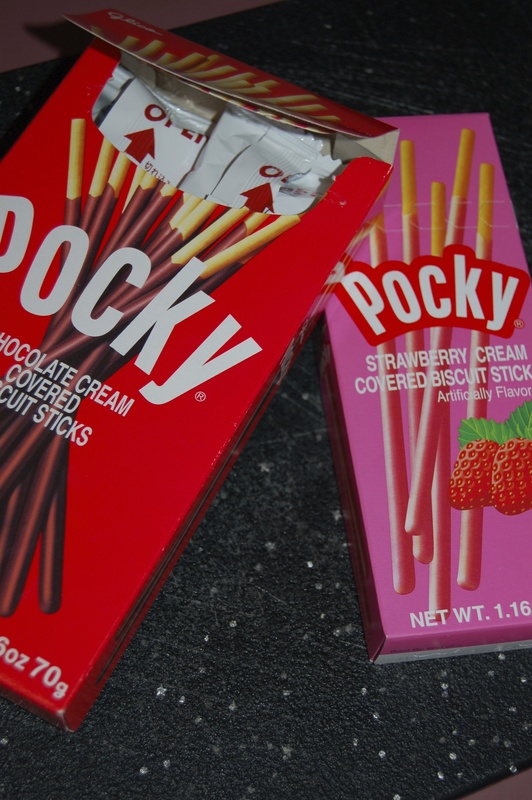 What is this Pocky anyway (pronounced po-ki): well if I grew up in Japan it seems it would have been as iconic a thing to me as what? : Cadbury’s chocolate to me and possibly Hershey Kisses to American kids. It is a slim plain snappy biscuit covered in a thin assortment of chocolate or creamy flavors. The first one came out in 1966 and was chocolate which is my absolute favorite. The box is bright and fun and is probably the reason my son was drawn to it in the first place. 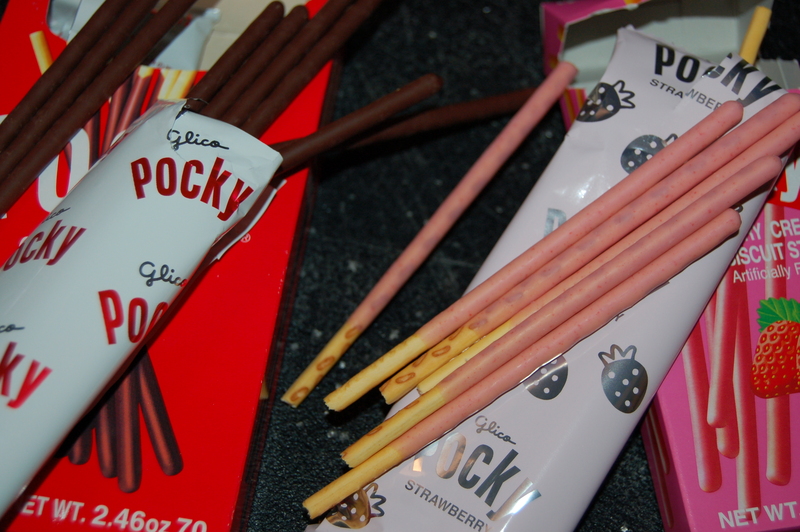 Pocky that are in my pantry right now! 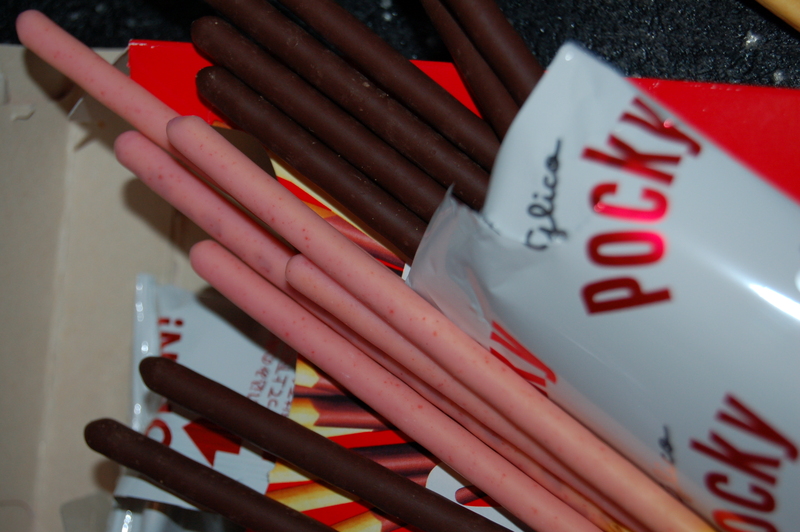 Over the past five decades the Japanese have made countless different flavors and even themed versions like “Decorer Pocky” which sports stripes, and one that amuses me called “Men’s pocky” which has a richer bittersweet chocolate! The ones that are available to me here in the United States are nothing to what is readily available in Japan. I can find dark chocolate (alas no “Men’s Pocky” to be found! ), milk chocolate, strawberry cream, almonds and chocolate, salted chocolate and a mint. I will need to go to Japan (and I fully intend to!) to get my hands on things like mango, green tea, azuki bean, soy bean, black sesame, goka, and coconut to name just a handful! I love a half-dozen of these little sticks with a cup of coffee: dip then into the hot liquid and they literally melt in your mouth! They are also fun to eat. You can take two bites and it’s gone or you can eat it like my daughter, in one long succession of tiny chipmunk-like bites! So the mission is to scour your supermarket or Asian Shop for a box of these addictive delights. I have cooked lots of recipes with mirin and realize I haven’t explained what it is to those of you not in-the-know! Mirin is Japanese and was first introduced as a highly prized distilled alcoholic drink. Sake (which is Japanese rice wine) was mixed with rice, and/or sweet rice to make this drink which could be as much as 14% proof. This is over-simplifying the whole history of this wonderful condiment but suffice is to say that a few years or century later, industrious chefs got hold of it and starting adding it to dishes to enhance flavors. You know, the way wine is used in cooking today. 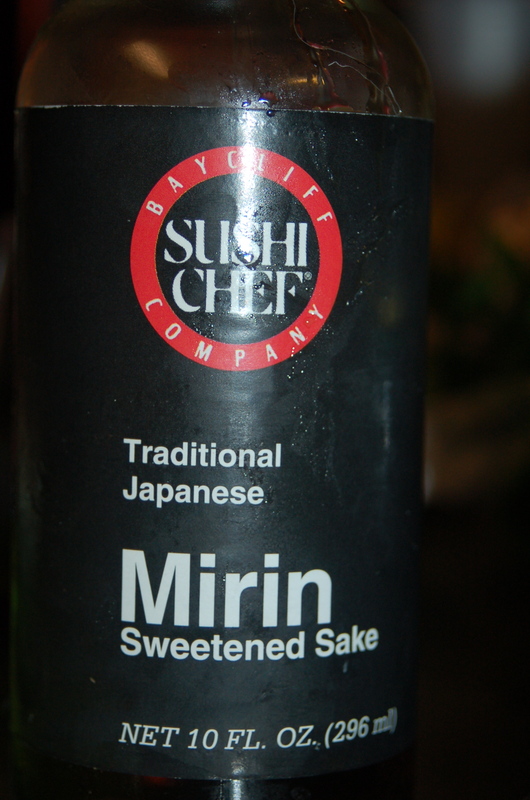 Authentic mirin contains rice, sweet rice, and water, and it has no additives or preservatives. The alcohol content was lowered for cooking to around 1 % so it qualified as a condiment, and not a taxable liquor. If you look hard to can find more authentic mirin. The local run-of-the-mill supermarket varieties have additives like fructose. This is still acceptable in a pinch. Mirin has a lovely sweet nuttiness and pairs great with salty things like soy sauce. It is Asian, so any kind of stir-fry is a vehicle for this lovely syrupy liquid. 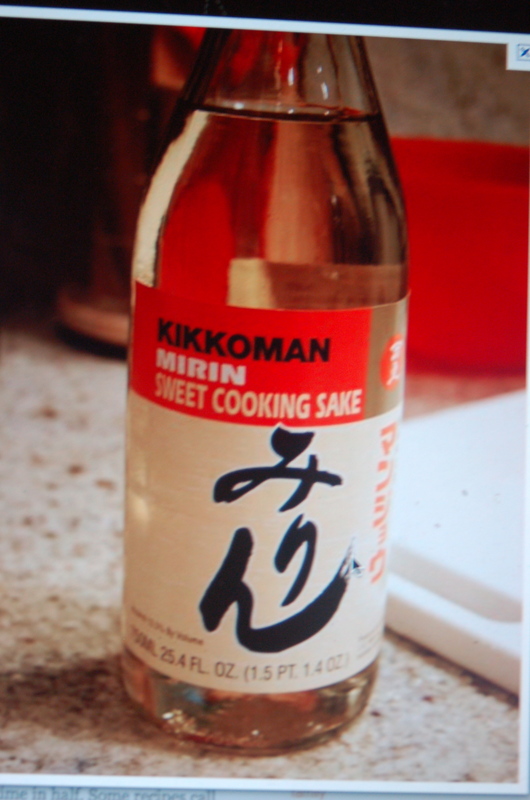 I also love it in a marinade for fish or soy sauce. It is less expensive than a nice balsamic vinegar or olive oil, so buy a bottle and give it a try. 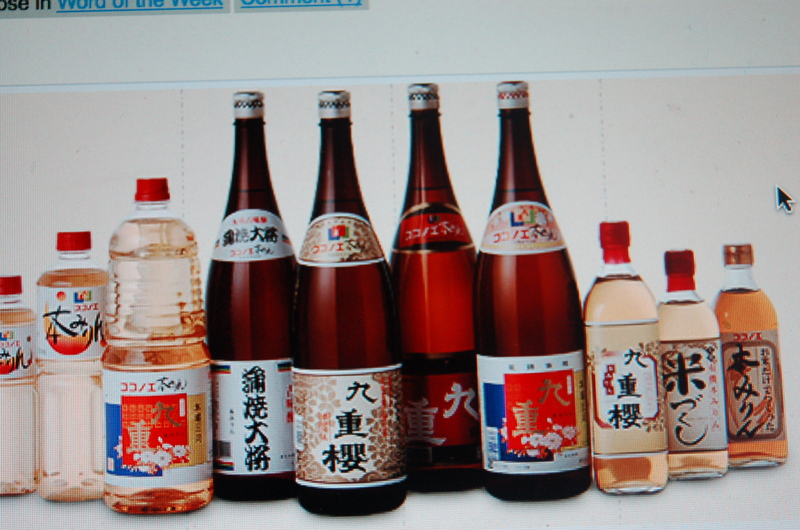 And, if you ever visit Japan, I would love a bottle of the real deal!